Be sensitive enough with the people around you when you eat lunch at your desk. Here are other good manners to follow when eating lunch at the office. Avoid pungent foods. It's a good idea to stay away from foods that contain garlic, onion or heavy spices—especially if you work in close quarters. Pungent foods like curry and chili can quickly permeate an entire office suite as well as your breath. Time your meal. 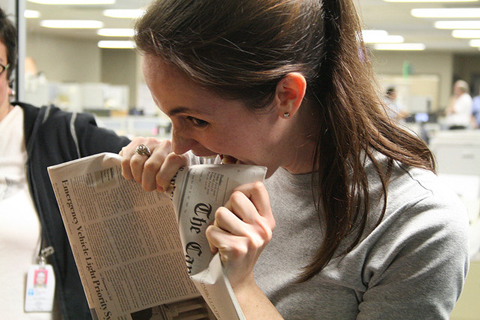 It's best to eat your lunch at your desk during the typical lunch hour. If everyone around you is eating, you're less likely to annoy people or distract your officemates. Tolerate interruptions. Don't expect your boss and co-workers to leave you alone while you eat. Especially if you work in a cubicle, it will be difficult to notify others you are unavailable. You can set your IM to away, but when you are physically in the office, others will assume you are available to talk. Turn off your phone. Your lunch hour can be a great time to catch up on work and e-mail while you eat, but do yourself a favor and put your phone on silent and take a break. Beware of bacteria. 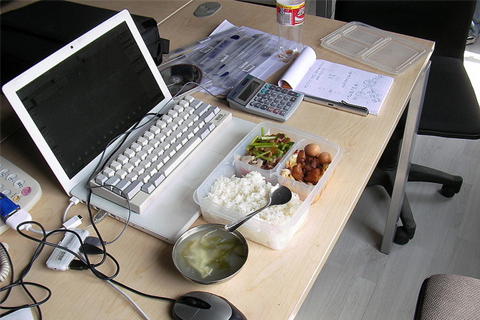 Your phone, desktop, keyboard, mouse and other office supplies can get messy when you regularly eat at your desk. Clean and disinfect your space daily and don't let leftovers and messy wrappers linger in your trash can overnight for the insects to enjoy. Keep the office kitchen clean. Clean up after yourself. If you share a kitchen with others in your office, be cognizant of any mess you accidently leave behind. Clean any dishes you use right away and don't let your plates, utensils or coffee cups sit in the sink for hours. Ask if people mind. When in doubt, ask your office neighbors if they mind you eating at your desk. I always ask this question of my seatmates when I want to eat something on an airplane. It's important because some people are sensitive to certain foods such as peanuts.